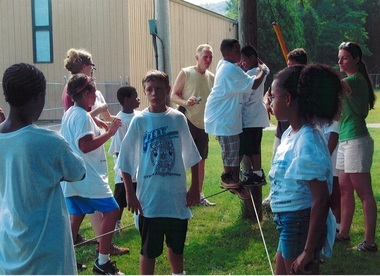 SYRACUSE, N.Y. -- Children with a high risk of joining gangs can attend a summer program sponsored by Syracuse police to help keep them out of trouble. The G.R.E.A.T. Summer Youth Academy is meant to teach kids how to cope with pressure to join gangs through team and confidence building exercises, said Lt. Geno Turo. The year-long program, Gang Resistance Education and Training, is a national initiative that teaches kids how and why they should stay out of gangs. Three officers, who are also certified teachers, run the Syracuse-based program. Turo said one major team and confidence building exercise they do at the summer sessions is an obstacle course that requires kids to complete individual tasks to help their team finish the course. The course starts on the ground before rising to a height of 30 feet, where kids try to do it again while wearing safety harnesses. Turo said other activities include role playing games, field trips and lectures. "This is our only line of offense (against gangs)," Turo said. The summer academy is also meant to create a relationship with police officers and young people who might come from a community where mutual respect between the two does not exist. "Their environment tells them police are evil," Turo said, adding that reports of officer shootings, such as the one in which a black man was shot and killed while running away from police in South Carolina, do nothing to help ease tensions between the groups. "That's not who we really are. That's an exceptional disgrace to our field," Turo said. He admits that not everyone can be saved from turning toward a life of crime or drugs, but he steadfastly says the prevention programs work. He said students tell officers from one year to the next that they've used skills they learned at the summer academy or through G.R.E.A.T. to stay out of gangs. "Those are the little success stories," Turo said. Applications for the summer academy can be found at the Syracuse Police Department website.